Ever since President Bush’s inauguration, various media have kept themselves busy exploiting his figure, or covering every single move of his (I personally cannot live without Will Ferrell’s Bush in SNL). 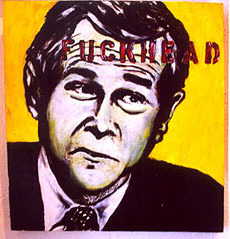 In the article “The Art of Loving Bush” (from Coagula Art Journal #50, March 2001), Julien Nitzberg says, “…art is better under Republicans”. Of course, we have to admit that more has to do with this man’s charm, perhaps. Bush has literary become the idol of political propaganda. His various face expressions are just perfectly iconic. 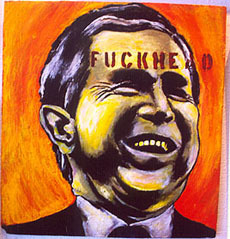 New Bush art is constantly found on the street and even making its way into galleries. These two pieces seen here are paintings by Winter (Rhonda Winter, images: courtesy of New Image Art), who also pursues photography and peformance art. Every time when come across President Bush’s article in a newspaper, I cannot resist a smile imagining the creative force being tickled somewhere out there.